Pass Along Some Savings! 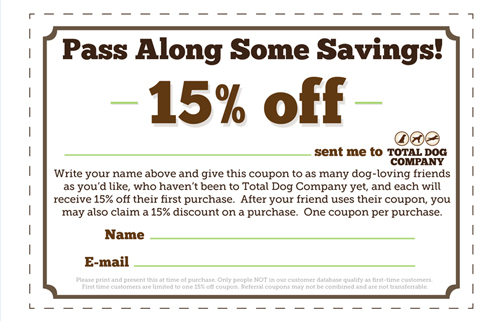 Give and get 15% off when your dog-loving friends make their first purchase at Total Dog Company! 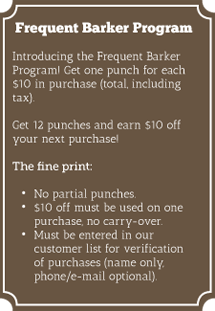 You can earn one 15% off coupon for every dog-loving friend you refer that makes their first purchase. Click the coupon image above or download the PDF here. Fill in your name and email to your friends, or print it out and hand it to them in person! Coupon must be printed and presented at time of purchase. Only people NOT in our customer database qualify as first-time customers. First time customers are limited to one 15% off coupon. Referral coupons may not be combined and are not transferrable.